L-R: Sanders Manning, Lester Anderson, Bob Barth, and Robert Thompson, 1964. 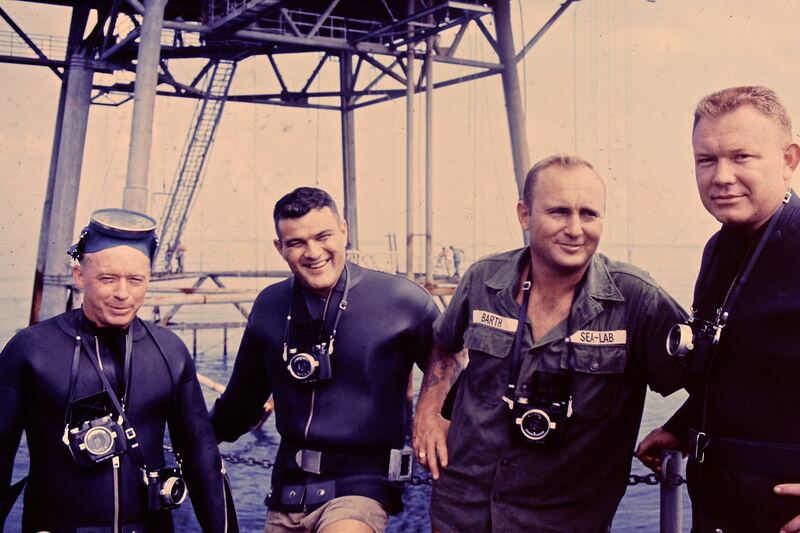 This film tells the mostly forgotten story of the U.S. Navy’s daring program that tested the limits of human endurance, revolutionized the way humans explored the ocean and laid the groundwork for undersea military missions to come. Based in part on the book SEALAB: America’s Forgotten Quest to Live and Work on the Ocean Floor by Ben Hellwarth, the film was written and directed by Stephen Ives, produced by Amanda Pollak, and executive produced by Mark Samels. Sealab premieres on American Experience Tuesday, February 5, 2019 at 9 p.m. on WXXI-TV. Please note: This program was originally scheduled for February 5 but was pre-empted due to the President's State of the Union Address. As a result, Greeley Expedition: American Experience, which was originally scheduled for tonight will not air on WXXI-TV, but it will air on WXXI-WORLD on Friday, February 15 at 8 p.m. as well as Saturday, February 16 at 9 a.m. and 3 p.m. In the spring of 1964, Scott Carpenter — already famous for being the second American to orbit the earth — was preparing for a new mission, not into space as an astronaut but into the sea as one of the Navy’s newly-minted “aquanauts.” Divers who attempted to chart the ocean’s depths faced barriers that had thwarted humans for centuries: near total blackness, bone-jarring cold, and intense pressure that could disorient the mind and crush the body. Aboard Sealab, Carpenter and his fellow explorers would attempt to break through those barriers – going deeper and staying underwater longer than anyone had done before. Their daring exploits were beginning to capture the nation’s attention, but a deadly tragedy would prematurely end their pioneering work. An audacious feat of engineering — a pressurized underwater habitat, complete with science labs and living quarters — Sealab aimed to prove that humans were capable of spending days or even months at a stretch living and working on the ocean floor. The project was led by George Bond, a former doctor from Appalachia turned naval pioneer who dreamed of pushing the limits of ocean exploration the same way that NASA was pushing the boundaries of space exploration. The challenge was to counteract the danger from the effects of atmospheric pressure underwater which compresses air – the further a diver descends, the more the air molecules in his lungs become concentrated. Under the increasing pressure, the air molecules are absorbed into the blood and tissues, but too much oxygen becomes toxic and causes convulsions; too much nitrogen causes a woozy fog that can be deadly. Equally dangerous are the problems compressed air can create as the diver resurfaces: ascending too quickly releases the gas as bubbles, causing the crippling and often fatal cramps known as “the bends.” Sealab would pioneer was is known as “saturation diving,” which would allow divers to remain undersea — and emerge unscathed — for more extended periods of time.